On September 20, 1972 Ed Francis presented a professional wrestling card at the Honolulu International Center featuring major wrestling stars from from the AWA, NWA, Japan and the WWWF. In the opening match Sam Steamboat defeated Mr.X. In the next match Jimmy Snuka defeated Ray Kamaka. In the the first main event of the evening Fred Curry retained his Hawaiian Heavyweight Championship by defeating John Quinn. Jimmy Snuka connects to Ray Kamaka's chest with a flying Drop Kick. A stunned Ray Kamaka looks to the corner for refuge. Fred Curry arm flips John Quinn on his behind. Referee Nolan Rodrigues makes sure that John Quinn's Face Lock is not a choke hold. Lord Tallyho Blears introduces The Sheik. 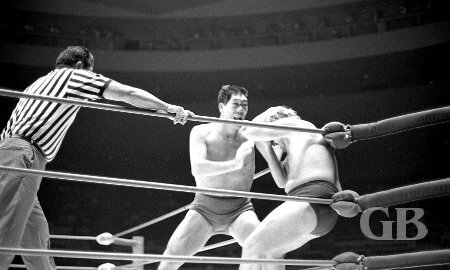 The match between Giant Baba vs. The Sheik ended in a draw when both wrestlers ended up fighting outside the ring and were counted out. Note: This match was filmed for Japanese television and can be viewed on YOU TUBE( add link). Baba throws the Sheik into the ropes. Both wrestlers continue wrestling while on their knees. An angry Baba readies his attack while outside the ring. Baba traps the Sheik in his own corner. Pedro Morales slams Nick Bockwinkel while his partner Wahoo McDaniel watches. Ray Stevens and Nick Bockwinkel try to lure Wahoo into the corner. The next match had Nick Bockwinkel and Ray Stevens putting their AWA World Tag Team Championship against the team of Wahoo McDaniel and the current WWWF World Champion Pedro Morales. The match ended in a double disqualification when all four wrestlers were disqualified for fighting inside the ring at the same time, thus allowing Bockwinkel and Stevens to retain their titles. Ray Stevens holds a tight Head Lock on Wahoo McDaniel while his partner Nick Bockwinkel tries to engage the referee. Pedro Morales chokes Nick Bockwinkel with a stool while outside the ring. 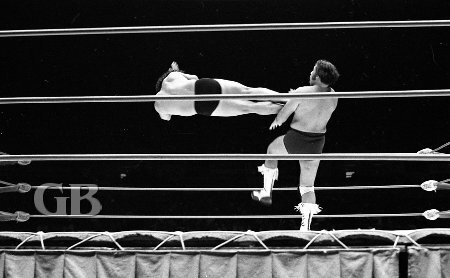 Ray Stevens about to land an elbow onto Wahoo. 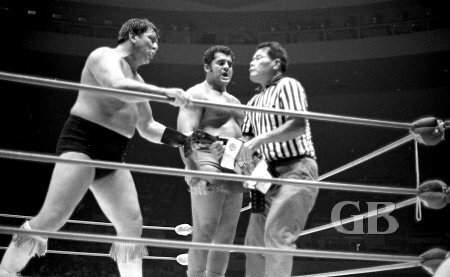 Wahoo and Morales feel the belts are theirs while referee Wally Tsutsumi begs to differ. Fred Blassie works over Ed Francis in the chicken wire covered ring. In the last match of the night, Ed Francis defeated Freddie Blassie. This match featured a ring that was surrounded by chicken wire. Blassie tries out his pearly whites on Ed Francis' face.